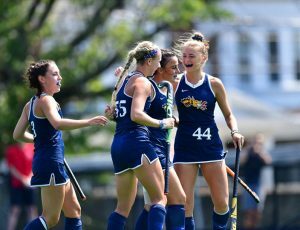 Despite the Drexel University field hockey team failing to qualify for the Colonial Athletic Association playoffs, select Dragons have been honored by the conference for their strong play this season. Four players — Tess Bernheimer, Tess Horan, Delaney Baxendale and Avery Powell — were honored by the CAA Nov. 1. Forward Tess Bernheimer received the highest honor on the team, earning first team All-CAA honors. The junior from Lewes, Delaware, set career highs in goals and points while leading the team in both categories. Bernheimer also had a team-high three game-winning goals, with clutch goals against Fairfield University, Bryant University and Monmouth University. This is not the first time Bernheimer has been honored by the conference. In 2016, during her freshman season, Bernheimer was named to the CAA All-Rookie team and was named CAA Rookie of the Year. It was the first time ever a Dragon was named CAA Rookie of the Year. Junior Tess Horan was named second team All-CAA. The midfielder started all 18 games for Drexel, netting three goals and one assist on the season. Horan was also named to the CAA All-Rookie team in 2016. Senior Delaney Baxendale also earned second team All-CAA honors. In her final season, she started every game for the Dragons and was a team captain. Baxendale played more than anyone else on the team, with 1,275 minutes tallied, and scored one goal on the season. Lastly, freshman Avery Powell was honored by the conference for her strong first season, earning a spot on the All-Rookie team. The rookie, from Moorestown, New Jersey, finished the season with three goals, three assists and nine points. Powell scored the first goal of the season for the Dragons in the season opener against the No. 7 University of Virginia Cavaliers and also netted a game-winner against the Hofstra University Pride Oct. 26. Next season, Bernheimer, Horan and Powell will return to the Dragons to help the team pursue their first conference playoff berth since 2016.